A new Star Wars movie is coming up next month, and that means Electronic Arts has a new Star Wars game. 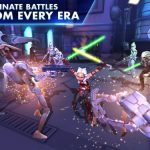 Star Wars: Galaxy of Heroes (Android, iOS) invites you to “play today to unlock a FREE First Order Stormtrooper” inspired by the upcoming film, The Force Awakens. 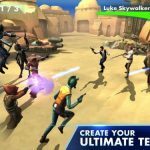 You can collect Star Wars characters from all episodes, all eras, and conquer your opponents in epic, RPG-style battles. It’s your job to create teams and come up with a good tactical strategy that would allow you to win the battle. You can build light and dark side teams with Jedi and Sith heroes alike, and choose characters whose abilities complement each other and give you the best combination to ensure victory. 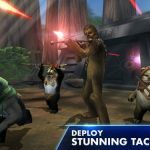 We’re not going to tell you much more about the game’s features, but if you’ve been looking for some tips and tricks to get you started in this game, here’s our Star Wars: Galaxy of Heroes strategy guide, specifically designed for the newbie, but also very helpful to more experienced players as well. All heroes that you can unlock in this game have specific actions that they’d be able to pull off when it’s their turn to attack. What you want to do is to familiarize yourself with the skills of each hero, and also be aware of what those skills can do and when you should utilize them. Cool down time is another important factor to take into account; the last thing you want is for you to use a powerful skill that has a long cool down time, as many enemies will be able to take full advantage of that. That blue meter you see underneath each character’s health bar shows you how long you have to wait before they attack. They’ll go ahead and attack when that meter is fully filled up. Pay close attention to the blue meter and plan your strategy the right way. We would advise you to choose a target to focus on; in most cases, the enemy who’s shooting last would be the best target to go for, as you’ll have a solid chance of taking them out before they make any further move. Look at your enemies’ meters and use that as well to map things out. You don’t want to have multiple enemies with their health in the red; they’re still alive, which means they can still attack. Instead, what you want is to make sure you’ve killed one enemy before moving on to the other. It’s not a good idea to take out huge chunks of multiple enemies’ health without actually killing them, because they can still inflict damage. Normally, you should set your sights first on the strongest enemy fighter, but there are other times when you’ll have to do the opposite and target the weaker enemies before the stronger ones. This is when the strongest enemy has a whole lot of health, as lesser enemies can easily take advantage of the fact that you’re dealing with an extremely high-health character. Star Wars: Galaxy of Heroes has a whole lot of characters you can unlock, but at first, you’ll have no choice but to work with some underwhelming characters. But you don’t have to give up on them so easily – just keep training them so that way, they can step up for you in the more difficult missions. 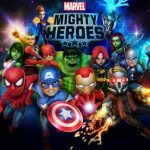 Upgrade your best, most-skilled characters before the lesser ones, and if you’re able to unlock a new, and more powerful hero, you can get rid of the less skilled heroes at that time. Always equip a character once you’ve gotten the equipment that’s required for them. You can equip a number of items, but it’s only once all the available slots are filled up when you can upgrade your character. This will allow the equipped items to provide valuable bonuses and would also allow you to equip more items. All in all, this can be a big benefit for your stats, so keeping that in mind, focus on your best characters before working your way towards the lower-ranked ones. 6. What Should You Do If You Can’t Find An Item? It’s very simple. While viewing your character, tap on an inventory slot, then tap on the Find icon. That will point you towards the mission you should accomplish so you can get the item in question. And again, keep on upgrading whenever and wherever you could. Arguably, this tip may require a lot more ink than others, and who knows – we just might give you a separate list of tips and tricks for unlocking additional characters. The easiest and simplest way to unlock more characters is to grind – just keep playing and replaying missions on Hard mode so you can get Character Shards. You can then exchange these so you can unlock new characters, or if you’d rather not add anyone to your team just yet, you can use them to evolve existing characters you like. Competing in special events is another good way to unlock characters or get more shards. Additionally, you can unlock new characters by buying Data Cards, or picking up any Data Card you may see lying around. That would increase the odds of your getting new characters or shards. That’s all there is to it, but if we are to give one final piece of advice, it’s not to rush things at all. Don’t overwhelm yourself by trying to unlock too many heroes; they will arrive naturally, especially if you play this game regularly. It’s never a good idea to be way in over your head because you tried to unlock heroes (or other goodies) too fast for your own good.